Download videos from video sharing sites up to 6 times faster. 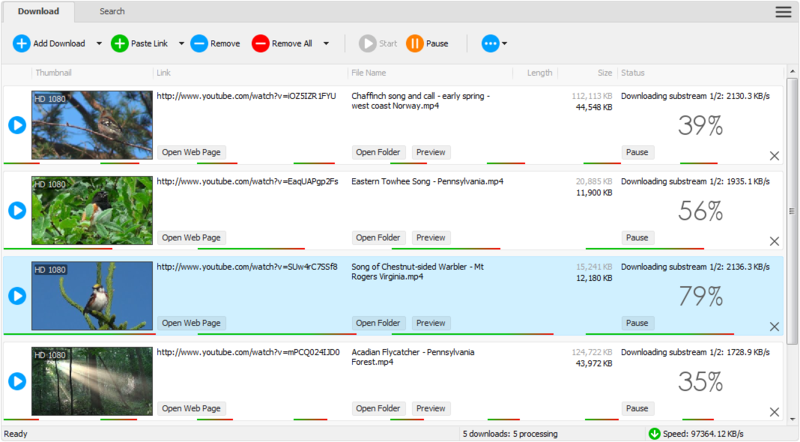 Any Video Downloader Pro, formerly known as HD Video Downloader Pro, is a Windows app to help you download videos from YouTube, Facebook, Dailymotion, and thousands of other video sharing sites. It accelerates your downloads by up to 6 times. Any Video Downloader Pro can download HD 720p, 1080p, 2K, 4K, and 8K videos from YouTube, Facebook, Dailymotion, Vimeo, Metacafe, and thousands of other video sharing sites. Any Video Downloader Pro features a multi-threaded acceleration engine that can boost your download speeds by up to 600% faster. Any Video Downloader Pro supports simultaneous downloads. It allows you to download more than one video at a time. Any Video Downloader Pro allows you to pause and resume your downloads if you need more connection to perform other important tasks. While downloading, you can click the Preview button to play the incomplete file and make sure the content you are downloading is really the content of your choice. Just enter a YouTube playlist link or ID, the program will download all or part of videos in the playlist from YouTube for you. Any Video Downloader Pro has a built-in video search engine. You can easily search for videos on the web within the program and download any video with just one click.